Iceland, Costa Rica, and Sweden are listed as leading the way in renewable energy. 1 As Foundation Director, Barrett Walker has visited all three countries on personal trips. Trustees Thomas & Barrett also visited Costa Rica on Foundation site visits. These three countries show, that in favorable sites, renewable energy can replace fossil fuels for electricity production. Iceland has a population of only 350,000 on a land area the size of Kentucky, making it the most sparsely populated nation in Europe. The country generates almost 100% of its electricity from renewable sources and has a high standard of living. 75% of that electricity is from hydropower fed by meltwater from high-elevation ice fields, and 25% is from geothermal wells that also pipe heat to buildings. Iceland sits on a volcanic hotspot providing abundant energy, but also subjecting the country to damaging volcanic eruptions. Although geothermal power releases carbon dioxide from below the earth, the amount is only about one-sixth of the emissions from a natural gas power plant. 2 Iceland is experimenting with capturing a small portion of the carbon dioxide and converting it into methanol for use as a gasoline additive. Costa Rica produces over 98% of its electricity from renewable sources with 80% coming from hydropower. The country has a highly advantageous location on a mountainous continental divide in the tropics, with high rainfall and extensive forest cover. Volcanos allow the country to produce 10% of power from geothermal wells. An additional 10% of power comes from windmills. 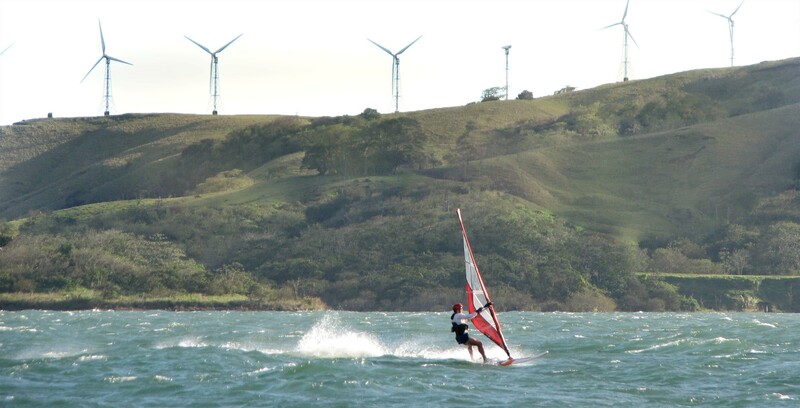 As a windsurfer, Barrett Walker can attest to the strength of the steady winter winds in parts of Costa Rica. Costa Rica’s renewable revolution is admirable. But, despite having supported projects in Costa Rica and traveling there over many years, the Foundation Trustees reluctantly conclude the Country does not serve as a model for how the world can reduce fossil fuel emissions. Because most of Costa Rica’s population of five million lives in the spring-like climate of the central valley, the country uses relatively little electricity for heat or air-conditioning. Construction of additional hydroelectric dams is criticized by local environmentalists and indigenous people whose land would be flooded. There is a limit on how much energy renewable hydropower can provide, and hydropower is the source of over three-fourths of the Country’s renewable energy. Wind and hydroelectric power in Costa Rica. The wind power plant of Tierras Morenas overlooks Lake Arenal in Costa Rica. The Lake was tripled in size with construction of the Arenal hydroelectric dam. Costa Rica and Iceland lead the world in producing almost 100% of their electricity from renewable energy. Photo by Barrett Walker. Sweden generates over 50% of its electricity from renewable sources. 6 The country has around 300 glaciers and abundant hydropower. Although Sweden plans to deploy more wind farms, 35-40% of Sweden’s electricity is produced by three nuclear plants that generate power independent of varying weather conditions. Despite the accomplishments of these countries in generating electricity from renewables, the Foundation trustees concluded that each country has specific advantages that make it unlikely more populous nations including the U.S., China, and most of Europe, can repeat their success in deploying renewables for more than a portion of existing electricity demand. Few nations have such advantageous locations for producing renewable energy. Given the vast increase in electricity production needed to shift transportation away from petroleum, the trustees reached the opinion that renewables alone can meet only a portion of global power needs. How did the public come to embrace renewables as a solution to global warming? One prominent researcher is professor Mark Jacobson at Stanford University. In 2011 Jacobsen published a highly influential two-part study titled “Providing All Global Energy with Wind, Water, and Solar Power”. 7 Foundation director, Barrett Walker was so impressed by the study that he flew out to Stanford and met with Professor Jacobsen. Despite the extensive research involved in the study, and the respect accorded Dr. Jacobsen by his talented cadre of graduate students, Barrett reported back to the trustees that the study was based on flawed assumptions. Because the Jacobson study provided a politically-acceptable solution to global warming, many environmental groups embraced the findings, giving renewables credibility. With fossil fuel companies seeking new markets for fracked natural gas, the potential replacement of nuclear plants with renewables presented an opportunity for millions of new customers. Leaders in the energy industry knew that renewables are unreliable and would have to be backed up by reliable baseload power. Jacobson was soon consulting with eager clients. “Clean” natural gas suddenly had a new, expanded market. Gas was billed as a transition fuel that would replace dirtier coal, until in some future year, renewables and energy conservation could meet 100% of our power needs. The scenario was so appealing the press joined in on the renewables bandwagon. Jacobson claimed victory in the press when he withdrew the $10 million libel suit in Feb. 2018. 10 The suit was likely withdrawn because it could not be won based on the facts. Jacobson received far more publicity for promoting 100% renewables than the subsequent challenge revealing that he used flawed assumptions. 12 Countries Leading the Way in Renewable Energy, Click Energy, Aug. 10, 2017. Geothermal Energy Information and Facts, National Geographic. Costa Rica is Not 100% Renewable: Pet Peeves in Zero Carbon Reporting, Rezwan Razani, Dec 31, 2018. Costa Rica oil consumption 1984-2014 (the most recent year avail.) The Global Economy: Economic Indicators for Over 200 Countries. The World Bank: Data, Total Greenhouse gas emissions (kt of CO2 equivalent). Energy Use in Sweden, Official Site of Sweden, 2018. Providing all global energy with wind, water, and solar power, Part I: Technologies, energy resources, quantities and areas of infrastructure, and materials, Mark Z. Jacobson and Mark A Delucchi, Energy Policy Vol. 39, Issue 3, March 2011. Part II Reliability , system and transmission costs , and policies, Jacobson and Delucchi, Energy Policy, March 2011. Evaluation of a proposal for reliable low-cost grid power with 100% wind, water, and solar, Christopher T. M. Clack, Staffan A. Qvist, Jay Apt, Morgan Bazilian, Adam R. Brandt, Ken Caldeira, Steven J. Davis, Victor Diakov, Mark A. Handschy, Paul D. H. Hines, Paulina Jaramillo, Daniel M. Kammen, Jane C. S. Long, M. Granger Morgan, Adam Reed, Varun Sivaram, James Sweeney, George R. Tynan, David G. Victor, John P. Weyant, and Jay F. Whitacre, PNAS: Proceedings of the National Academy of Sciences of the United States of America, June 27, 2017. Scientific Row over Renewables Leads to Free Speech Legal Fight, By Ilima Loomis, EOS Science Policy & Funding News, Feb. 15, 2018. Stanford professor withdraws $10 million libel suit against journal, academic critic, by Chris Mooney, The Washington Post, Feb. 23, 2018. Big Solar’s Death Panels, by Kiera Butler, March/April, 2011. Wind turbines are actually slaughtering millions of birds and bats annually, Save the Eagles International.